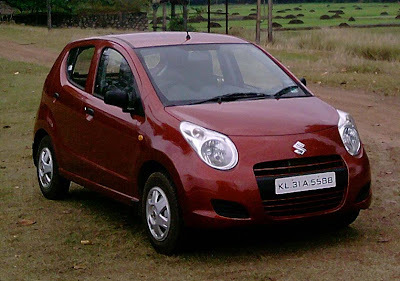 Finally i went for Maruti Astar.Here are the reasons that convinced me to choose a maruti. Maruti cars are comparatively cheaper to maintain.Service stations are everywhere and spares are easily available. Fuel Efficiency of Astar as certified by ARAI is 19.6 kmph . In the interior more space is dedicated to the driver and his fellow passenger. I wanted a small car to move it around in indian roads. I liked the looks of Astar. Most of my usage is in the weekends and 80 percent of the travel with rear seats empty. Since i am working online in my office room in home, i won't be driving everyday to office.That is why i wanted a petrol car. There is not much space in Astar. My take: It depends on what the customer expects.I am expecting a small car and not an innova like vehicle or a long sedan. No cash back or discount. 35 litre fuel tank capacity. Maximum speed of 155 km per hour. Front Power Windows Sold by Maruti. Keyless Entry Security System marketed by Maruti Suzuki. Sony Xplod MP3/ CD Player - Plays USB Drives too. Till now i drove 3300 kilometers on it.After five months, i am satisfied using maruti astar.